Breeding & Training Versatile Hunting Dogs for Hunting and Hunt Tests is the first book covering both breeding and training of your versatile dog for upland bird hunting, waterfowling, shed hunting, blood tracking, along with numerous human interest chapters. This book starts with the most insightful and complete explanation of what a quality breeding program involves: how to breed better dogs, how to achieve genetic diversity, selecting the best stud dog, reading a pedigree including the different breeding coefficients and how to use Hunt Test information to support breeding decisions. Bob's Cedarwood Pudelpointers (clients purchasing pups) have seen nearly 400 NAVHDA natural ability test entries across North America with a 90% success rate passing this test since he began his breeding program. Also, 175 NAVHDA utility test entries had a 74% success rate. 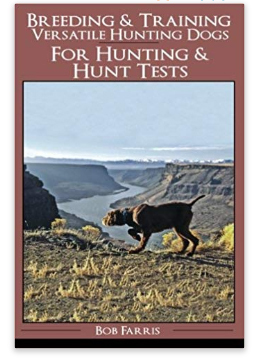 Bob gives outstanding coverage of how to train your dog for any of the Hunt Test organizations offering natural ability tests as well as their utility tests. Of the 106 dogs Bob trained/handled in NAVHDA's natural ability test he earned 81 Prize 1s and of the 49 dogs trained/handled in utility he earned 15 Prize 1s with all dogs prizing. He has paid his dues in the testing arena and his record speaks for itself. A hunter who sees 80 to 100 days annually in the field supports his knowledge to training for hunting wild birds. This book gives excellent advice on training your dog for hunting. Bob covers chukar hunting tactics, waterfowling from a blind, duck searches, tracking wounded big game and off season shed hunting. You do not want to purchase a versatile pup or plan to test your pup in any of the offered hunt tests without reading this book.